Mount Sinai Doctors Long Island Heart offers different types of cardiac stress tests, depending on the needs of each individual patient. 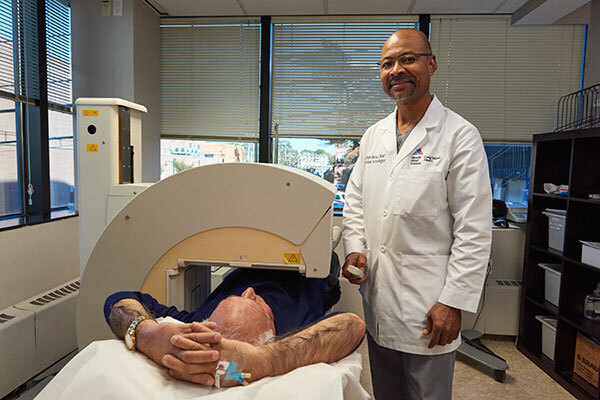 A nuclear stress tests, also known as a thallium stress test, looks for blockages in the coronary arteries by using a nuclear camera to take pictures of the heart during rest and exercise. These images are displayed on a screen and show blood flow to the heart muscle, which indicates the strength or weakness of the heart. The test begins by looking at the heart while resting. You will receive a small injection of Thallium®, which is an isotope that clings to the heart muscle and allows the nuclear camera to see the heart; it is extremely safe and there are no known adverse or allergic reactions. Expect to lie on a table under a nuclear camera for about 15 minutes while the camera circles around you recording information. For the second part of the test, you will be asked to exercise the heart, typically by walking on a treadmill. A doctor will monitor your blood pressure during the exercise to make sure you reach maximum exertion. If exercise is not feasible or recommended, a small dose of medication is given to increase your heart rate. After exercise levels have been reached, you will receive a small injection of another isotope call Technitum®, and again be asked to lie down on a table under the camera. Images of your heart after exercise are then taken. The nuclear stress test could find one of the following results, which your cardiologist will review with you as soon as the test is complete. If the results are abnormal, your doctor will go on to discuss treatment options. If the test shows blood flow is normal during both exercise and rest, the coronary arteries do not have significant stenosis (narrowing). heart is not receiving enough blood when it is working hard. This may be due to a blockage in one or more of the coronary arteries. If the test is abnormal during both exercise and rest, there is limited blood flow to the heart at all times. This could suggest a prior heart attack. Bring something to read or occupy your time between the various portions of the test. You may be at the office for up to four hours. Do not have caffeine or de-caffeinated drinks for 24 hours prior to your test. Instead, drink water, juice, or milk. Do not eat any solid foods for four hours prior to your test. Do not take the following medications for 24 hours prior to your test: Beta Blockers (these include but may not be limited to Toprol XL®, Metoprolol®, Lopressor®, Coreg®, Atenolol®, Tenormin®, Bystolic®, Carvedilol®); Nitrates (these include but may not be limited to ImdurÂ®, IsosorbideÂ®, Nitropatch); Excedrin®. Ask your doctor if you are taking additional medications that should be avoided before your test. If you are taking other medications for your heart or if you are diabetic, check with your doctor before taking them the day of your test. You may bring a light snack to have after the stress portion of the test. Wear loose, comfortable clothing and sneakers with rubber soles. No flip flops or open toe shoes. No shirts or blouses with metal buttons or zippers. Please notify our office if you are severely claustrophobic. Because there are no adverse side effects from the nuclear stress test, you will be able to drive immediately afterwards. A Stress Echocardiogram is a non-invasive test that combines two tests: a treadmill stress test and an echocardiogram (an ultrasound of the heart). If there are any abnormalities in heart function after exercise, this may be due to a blocked artery or coronary artery disease (CAD). This information is useful to your doctor to help establish a diagnosis and guide your treatment. A stress echocardiogram is done by a cardiologist who is assisted by a specially certified technician called an echocardiographer. The echocardiographer will begin by placing electrodes on your chest to monitor your heart rate and rhythm throughout the test. First the echocardiogram will be performed at rest while you lie on the exam table. Immediately following, you will begin to walk on the treadmill, which normally gets faster and steeper every three minutes. You will exercise until the doctor says you have done enough or you indicate that you have done enough. If you experience chest pain, shortness of breath, or if you become too tired, tell the doctor and the treadmill exercise will be stopped. After exercise, you will again lie on the exam table, and the second echo will be performed in order to see the heart functioning after exercise. The test usually lasts from 45 minutes to 1 hour. If you are unable to walk on the treadmill, your doctor may instead order a stress echocardiogram with a medicine called Dobutamine®, which gradually increases your heart rate, eliminating the need for exercise. In some patients, when a good quality echo cannot be obtained, the doctor may administer an intravenous medication to improve your pictures; the doctor will discuss this will you if it becomes necessary. Test results are given that day. Do not eat anything for four hours prior to your test, with the exception of water. Do not apply lotions or oils to your body. Wear loose, comfortable clothing and sneakers with rubber soles. No flip flops, sandals, or open toe shoes. Beta Blockers (these include but may not be limited to Toprol-XL®, Lopressor (Metoprolol)®, Tenormin®, Inderal®, Bystolic®, Corgard®, Coreg® (or Carvedilol®); Calcium channel blockers that slow the heart rate (these include but may not be limited to Cardizem CD®, Cardizem LA®, Calan®, Calan SR®, Verelan (Verapamil®), Tiazac®). Ask your doctor if you are taking additional medications that should be avoided before your test. Ask your doctor about adjusting insulin and food intake if you are diabetic. For patients with certain arrhythmias, poorly controlled hypertension, or severely blocked arteries, holding your medications may not be advisable. Please check with your cardiologist before your test. 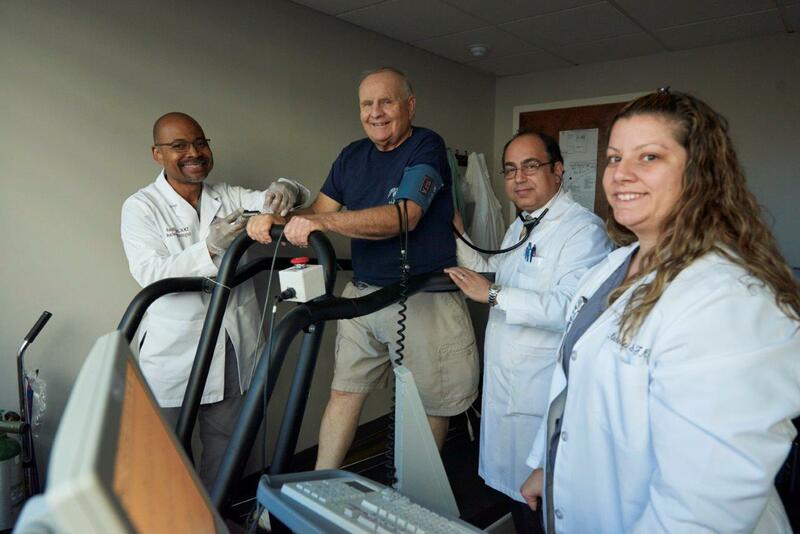 If you are unable to walk on the treadmill for the nuclear stress test, our doctors will perform a chemical stress test. The at-rest portion of this test is the same as with a nuclear stress test. But for the exercise portion, physical exertion is replaced with the administration of one of the three drugs (Lexiscan®, Adenoscan®, Dobutamine®) which will increase your stress levels. The chemical stress test involves the same results, preparation, and instructions as a nuclear stress test. Do not take the following medications for 24 hours prior to your test: Beta Blockers (these include but may not be limited to Toprol XL®, Metoprolol®, Lopressor®, Coreg®, Atenolol®, Tenormin®, Bystolic®, Carvedilol ®); Calcium Blockers (these include but may not be limited to Tiazac®, Cardizem CD®, Diltiazem®, CD®, Cartia Verapamil®, Calan®, Cardizem LA®); Nitrates (these include but might not be limited to Imdur®, Isosorbide®, Nitropatch®); Excedrin. Ask your doctor if you are taking additional medications that should be avoided before your test. Because there are no adverse side effects from the chemical stress test, you will be able to drive immediately afterwards.